Nosebleeds in children is quiet a common occurrence, though any one can suffer from Nosebleed Causes include blowing & picking the nosenosebleeds. There are many reasons that can give you a nosebleed. Common nosebleed causes include nose blowing & picking the nose. But it can also occur for reasons that are not apparent. Your nose can bleed if its delicate lining gets irritated due to cold or an allergic reaction. You can experience nosebleed symptoms if your nose lining goes dry or becomes cracked as a result of dry atmosphere. Underlying diseases including blood clotting disorder, hypertension or kidney disease can also turn into nosebleed causes. Treatment for nosebleed is fairly simple in most cases and can be done in the comforts of your home. You can stop nosebleed by following these remedies which are easy to get, effective, economical & easy to follow. Instill one or two drops of lemon juice inside the bleeding nostril. This is one of the effective ways you can try to stop nosebleed. The swelling and bleeding that occurs during nosebleeds can be effectively dealt with by applying ice pack on exterior part of the nose. 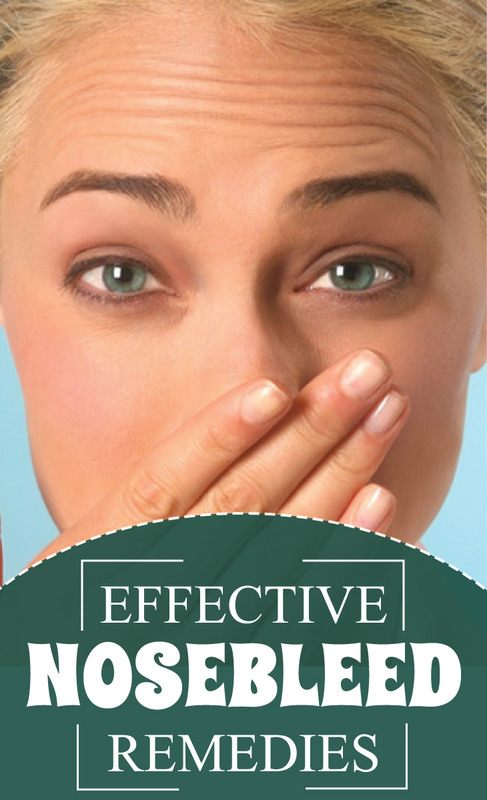 This is one of the easiest and the most common measure to cure nose bleeds. For frequent nosebleeds in children and adults, inhaling steam is an effective measure for minimizing recurrences. Mix a single pinch of salt in a cup filled with water, stir thoroughly. Spray this solution into the nostrils. This saline water is known to be among effective natural nosebleed remedies. A preventive measure to stop flow of blood from the nose is to keep your head elevated on a couple of pillows or sitting on a comfortable chair with your head elevated. Be careful so as to not bend over during nosebleed. Make a small sized cotton ball and dip it in apple cider vinegar. Apply it on the nose bleed. This will help the blood to clot and also give relief in nosebleed symptoms including pain. You can try placing a wet towel over your head. This is said to be effective during nose bleed. The above remedies do work in most cases for nosebleeds, but in case any of these remedies fail to stop the bleeding even after ten minutes, seek medical assistance without delay.